For nearly 80 years, the all-American Jeep has paved the way for military victories, civilian adventures, and off-road excitement. 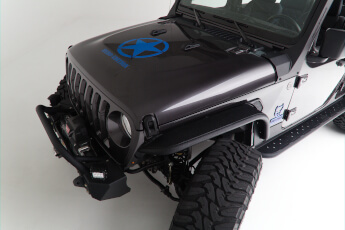 Now, Dream Giveaway honors America and our Jeep heroes with this one-of-a-kind Super Jeep. A Jeep isn’t a muscle car. A muscle car isn’t a Jeep. All that changes with the 2018 Jeep Wrangler Hero Edition. Open this grand-prize Jeep’s hood and you’ll find a genuine Chevrolet Performance Parts’ Corvette LS3 engine rated at 450 horsepower and pushing out 425 lb-ft of torque. A Corvette in a Jeep? That’s right. 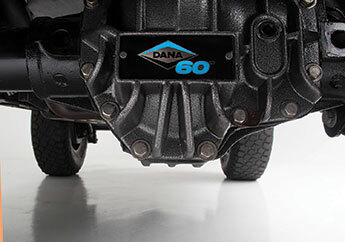 Enter and win, and you’ll know why Bruiser Conversions’ LS3 engine systems are the best in the Jeep business. 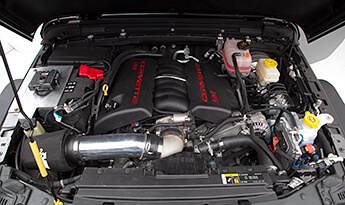 Bruiser provides an OEM-quality Corvette engine installation with proprietary performance tuning while retaining all of the features and functionality that make the Jeep Wrangler a legend in the car business. No incline is too steep. No rock is too large. That’s the motto of this grand-prize 2019 Jeep Wrangler Hero Edition. Take this grand-prize 2018 Jeep Wrangler Hero Edition with Toyo Open Country tires where automobiles dare not tread — like off-road trails, rock crawls, forest streams and wind-blown dunes. Or hit the paved road and your fun and adventure continues, thanks to the stylish good looks and well-engineered streetability of the Jeep Wrangler Hero Edition. When you enter to win the 2019 Ultimate Jeep Dream Giveaway, you’ll be in the running for this custom-built 2018 Jeep Wrangler Hero Edition. Plus, we’ll pay $10,000 toward your taxes. About Bruiser Conversions: Bruiser Conversions is the industry leader in fully integrated engine conversions for the Jeep Wrangler platform. They offer a full lineup of GM Performance LS3, Hemi, and Cummins Turbo diesel engine conversions for the JL, JK, and TJ platform. 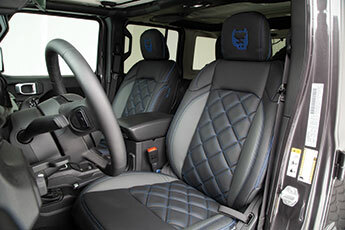 Bruiser also builds a full line of luxury off-road vehicles including the Super Cab, JK Crew, and Overlander.